Senator John Cornyn (R-TX) has signaled that he does not have the conviction to believe the new health care law is unconstitutional. He is leaning more and more to reworking health care, and focusing on jobs. What is it that our legislators do understand about “unconstitutional,” thus “illegal?” He is buying the Democrat load of poo, and while the government adds to its payroll, the private sector will struggle to stay alive – everything will come at the behest of the government. To make the point right of the gate: Sallie Mae has announced the government takeover of student loans is forcing them to layoff 2,500. Friends, the government creates absolutely no wealth. What happens to a government with no wealth producers? Take a look at 90% of the world’s countries living with no private sector wealth. This is unthinkable for America, yet with this president, it is a possibility. Democrats are doing what they do best. Selling. Cornyn is buying. Sen. Robert Menendez (D-NJ) publicly said that the issue of “repeal” is a sticky one for Republicans, because it is telling people something will be taken away from them. Menendez is not talking about the money out of our pockets, the loss of privacy between us and our doctors, the loss of control of our medical records, the loss of quality health care, the loss of employment as physicians retire and go elsewhere, and the loss of the relevance of the Constitution. Cornyn has clearly relegated the U.S. Constitution to his “I’ll get to it later” pile, or worse, to the trash heap of inconvenient rules and regs. Cornyn wants to focus on the “misplaced priorities of the administration.” He wants to focus on jobs. Can’t we focus on more than one attack on our citizens at a time? Pound them on both, and “up” the talk on immigration, please. The Democrats do it. We can too. Repeal the bill, and then put the portions you want to keep back into the new legislation. The American people trust nothing in this bill. Start over and get some conviction! If you don’t believe the legislation is unconstitutional, we do. What if we are right? Think about it, Cornyn. ObamaKare is a job killer AND it is unconstitutional. Sallie Mae is sounding a warning bell. Come out and tell the American people minorities will be the beneficiary of our tax money by funding government loans, minorities schools will be the beneficiary of our tax money, and once graduated, all loans will be forgiven if you go to work for the government for a certain period of time. Read about the government education bloat in the health care bill here. 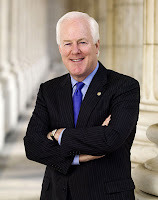 Here is a frightening thought: Cornyn is the head of the committee that choses which Republican candidates to support with GOP monies, and which will be not be supported. We need to watch this man like a hawk. He supported Charlie Crist and DeDe Scozzafava.